Members of the new sPHENIX collaboration at a meeting held at Brookhaven Lab in May 2016, with co-spokespersons Dave Morrison (green T-shirt, jeans) and Gunther Roland (blue shirt, black jeans) front and center. From the very beginning, there were hints that particle collisions at the Relativistic Heavy Ion Collider (RHIC) were producing something unusual. This U.S. Department of Energy (DOE) Office of Science User Facility at Brookhaven National Laboratory was designed to recreate the incredibly hot and dense conditions of matter in the early universe by colliding atomic nuclei at high enough energies to “melt” their constituent protons and neutrons. The collisions would “free” those particles’ inner building blocks—quarks and gluons—so nuclear physicists could study their behavior unbound from ordinary matter. 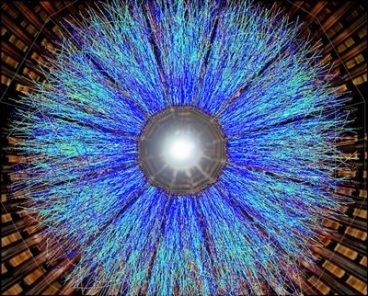 Results from RHIC show that these particle smashups have indeed created a superhot primordial soup called “quark-gluon plasma” (QGP)—but one in which the quarks and gluons, though liberated from their protons and neutrons, continue to interact strongly. These strong interactions make the plasma flow like a nearly “perfect” liquid. RHIC’s discovery of the perfect liquid set off a decade-long and very successful effort to characterize its remarkable properties—both at RHIC and at Europe’s Large Hadron Collider (LHC), where physicists conduct complementary studies of quark-gluon plasma for a few weeks of each year. But understanding exactly how the QGP’s perfect fluidity and other collective properties emerge from its point-like constituent particles remains a compelling mystery. 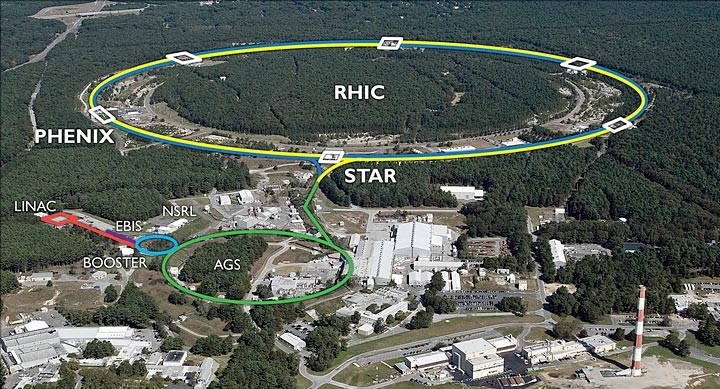 To address that mystery, a group of nuclear physicists has formed a new scientific collaboration that will expand on discoveries made by RHIC’s existing STAR and PHENIX research groups. This new collaboration, made up of veterans of the field and researchers just beginning their careers, has precise ideas about the measurements its members would like to make—and hopes of upgrading the PHENIX detector to make those measurements at RHIC. “What remains to be done is to understand how the QGP’s properties arise or emerge from the underlying quark and gluon interactions,” said Massachusetts Institute of Technology physicist Gunther Roland, a longtime RHIC and LHC collaborator and now a co-spokesperson for the new collaboration..
For now, the collaboration goes by the name sPHENIX: “s” for its focus on the strongly interacting particles and PHENIX for the anticipated use of key detector components and that experiment’s location in the RHIC ring once the existing PHENIX systems complete their data-taking lifetime at the end of this year’s run. But the collaboration leaders emphasize that there’s no need for members to be previously affiliated with PHENIX—or indeed with prior research at RHIC. “This is a new collaboration, and, if we get the go-ahead for this upgrade, this detector will have brand new capabilities,” Morrison said. Figuring out how the QGP’s properties emerge from its smallest particles requires a detector that can make more—and more precise—measurements of what’s going on in the plasma at different length scales. Particle detectors are the microscopes nuclear physicists use to dive down into the details of subatomic matter. But instead of shining visible light, electrons, or x-rays on the sample, particle detectors pick up signals from particles created within the collisions. Measuring how these particles move through and lose energy by interacting with the plasma will reveal information about the QGP at scales between the level of individual quarks and the long-scale collective behavior. “There has to be an evolution from the short-wavelength behavior to the long-wavelength behavior, and we want to probe that transition,” Roland said. One set of particles sPHENIX physicists are interested in tracking are upsilons—each made of two heavy quarks bound together. Each different bound state has a different mass. The sPHENIX scientists want to understand how upsilons with different masses form and disassociate and otherwise interact with the plasma. They’re also interested in analyzing collimated streams of particles called jets—created as the energy of individual fast-moving quarks and gluons is transformed into a cascade of new particles. Measuring how much energy is lost by higher- and lower-energy jets will convey information about both the individual particle scale deep within the plasma and its long-range characteristics. “The higher the momentum, the more rarely it is produced. So you need a very fast detector that can capture a lot of collisions to increase the chances of spotting these important events,” Roland said. By removing outdated components from PHENIX and replacing them with new, custom-designed systems, the sPHENIX collaboration would transform that experiment into a “new” state-of-the-art detector that can capture as many as 15,000 events per second—a significant increase over STAR’s current capture rate of 2,000 events per second, or PHENIX’s 5,000—with all the components needed to differentiate among the three mass states of upsilons and tease apart the full energy scale of jets. “This transformed detector would be suited to record a huge fraction of what RHIC can produce,” Morrison said. Physicists and engineers at Brookhaven and elsewhere have already begun building prototypes and testing components that could be used to achieve the anticipated transformation. And this endeavor is attracting a new generation of physicists eager to get in on the ground floor of a new experiment. Megan Connors and Anne Sickles checking out calorimeter components at Brookhaven Lab. 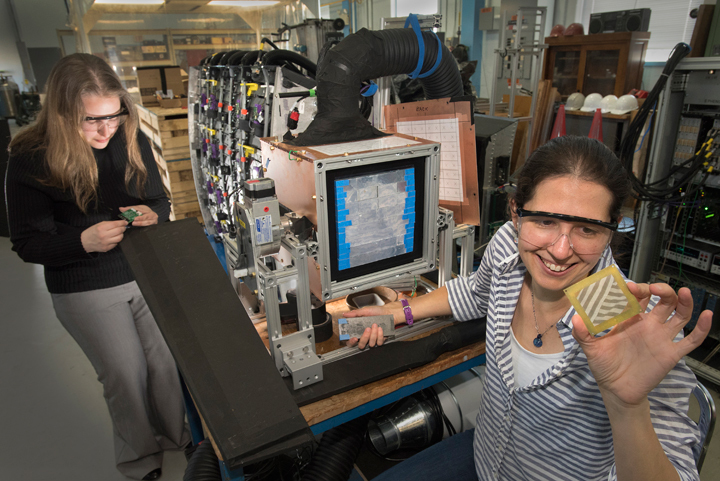 The piece of hardware that currently has her attention is a prototype “calorimeter” that would track and reconstruct the sprays of particles that make up jets, which recently underwent extensive testing at Fermi National Accelerator Laboratory. You also need to know how much energy the jet had to start with. Most of the time jets are formed in back-to-back pairs. Both jets lose energy in the plasma. However sometimes, instead, a particle of light called a photon gets produced back-to-back with a jet. But unlike the jet particles, the photon shooting off in the opposite direction does not interact with the quarks and gluons in the plasma, so it doesn’t lose any energy. Using Fermilab’s Test Beam Facility, Sickles and some of her students shot a beam of electrons through portions of an “electromagnetic” calorimeter they designed to track photons and some of the other particles that make up jets. For the initial tests, the electrons—pure electromagnetic particles like photons—served as stand-ins for the photons. The aim of the tests was to be sure all areas of the detector respond in a similar way, and that there’s no variation between pieces built by Sickles and her students in Illinois and pieces constructed by an outside contractor. 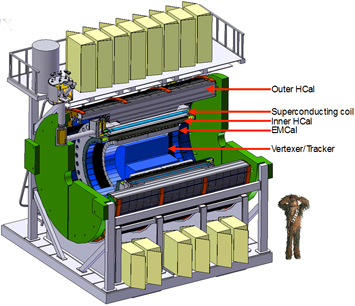 Next, the physicists added components of a “hadronic” calorimeter for tracking hadrons (particles made of more than one quark), which Connors and her team had been working on. They placed the hadron detectors directly behind the electromagnetic calorimeter—just as the two components will be arranged in the actual detector. This outer layer is designed to catch the larger hadron particles that make it through the first layer so physicists can account for the full energy of each jet. Building the calorimeter thick enough to “catch” all the particles is one way that the design of sPHENIX benefits from the 16 years of operating RHIC and several years experience at LHC. Testing is also underway on a 20-ton solenoid magnet acquired from a former physics experiment at DOE’s SLAC National Accelerator Laboratory. This magnet would form the heart of the sPHENIX detector, completely surrounding the collision zone like the cylindrical magnet at the center of RHIC’s STAR detector. Like STAR’s, the sPHENIX magnet would bend the trajectories of charged particles as they emerge from the collisions. But with three times the bending power of STAR, sPHENIX should be able to separate out the signals from the three types of upsilon particles, whose masses differ by only a few percent. So far, a team of engineers and physicists in Brookhaven’s Superconducting Magnet Division, Collider-Accelerator Department, and Physics Department has cooled the superconducting magnet down to its near-absolute-zero operating temperature of 4.2 Kelvin and tested it with 100 amperes of current. “We needed to test the overall health and integrity of the magnet to make sure all the joints and couplings are in place, in case they got jostled while being transported cross-country,” said lead magnet engineer Piyush Joshi. They also tested systems Joshi designed to shut the magnet down in a controlled manner if the field between the magnet’s two layers of coils ever gets out of balance. “You want to detect any imbalance very quickly so you can extract the energy before it causes any damage to the magnet,” he said. He originally wrote the algorithms for an LHC magnet project, but they proved to be just as useful for the sPHENIX tests. 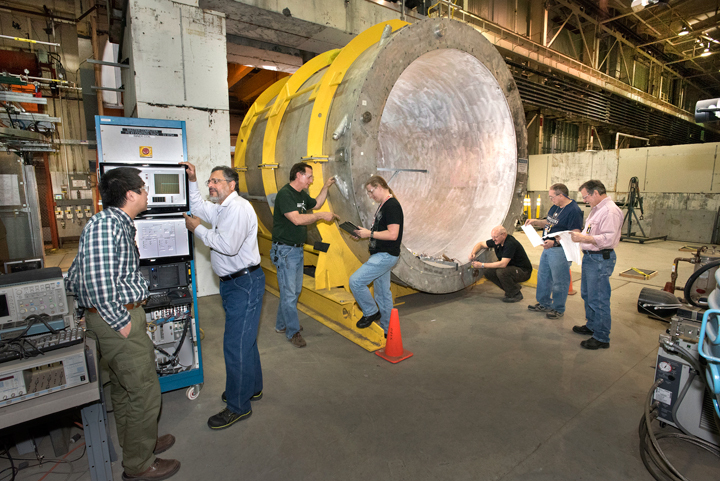 With the initial, low-field tests complete, the group will next use steel recycled from another older experiment at Brookhaven to surround the magnet to contain its most powerful field—and ramp it up to a full 4,600 amps. Engineers and physicists involved in testing the 20-ton superconducting solenoid expected to form the heart of the sPHENIX upgrade: Kin Yip, Collider-Accelerator Department (CAD); Piyush Joshi, Superconducting Magnet Division (SMD); Richard Meier, CAD cryo group; Brian Van Kuik, CAD main control room operations coordinator; Ray Ceruti, SMD; Sonny Dimaiuta, SMD; Dominick Milidantri, SMD. 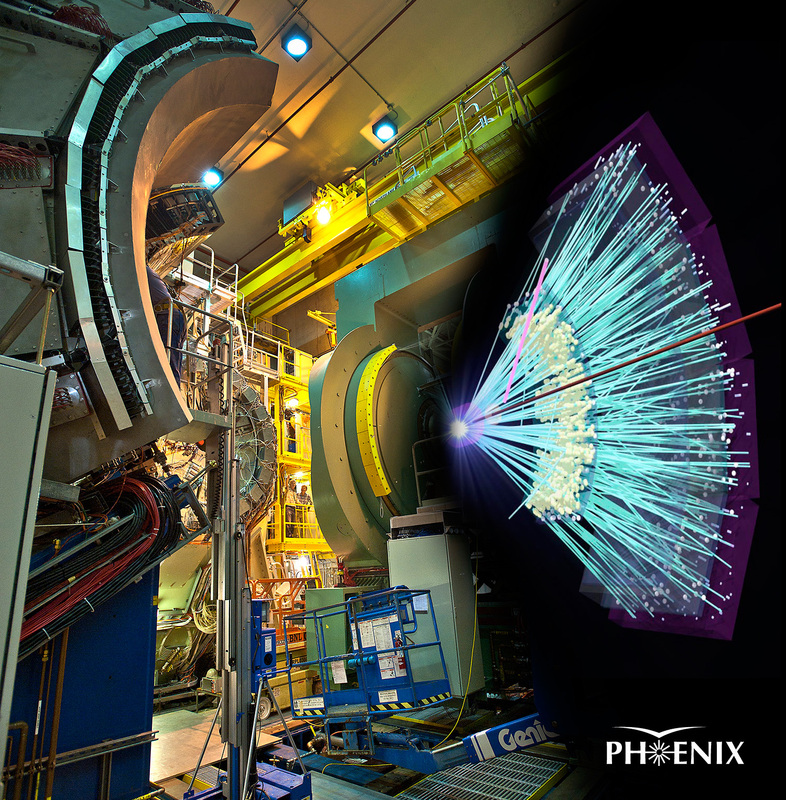 By reusing equipment and tools developed with funding for RHIC and the LHC, and inspiring university collaborators to chip in their expertise, the nascent collaboration has taken these early steps on the path toward transforming PHENIX into sPHENIX. But the team hopes to get an official seal of approval—and, eventually, a budget—from DOE. The 2015 Long Range Plan for Nuclear Science—a set of recommendations made by the nation’s Nuclear Science Advisory Committee to leaders at DOE and the National Science Foundation—identifies the sPHENIX “state-of-the-art jet detector” as “essential” to probing the inner workings of QGP at shorter and shorter length scales, one of two “central goals” noted in the report for completing the scientific mission at RHIC. The report also notes that there is significant international interest in sPHENIX. “Right now we have a collaboration of 183 people, and growing,” Morrison said, with those scientists representing 58 institutions in 10 countries. Looking ahead and continuing the tradition of making the most of our nation’s investments in science, the physicists designing the sPHENIX upgrades say this transformed detector could largely be reused as a detector for a future Electron Ion Collider—the next priority nuclear physics project identified in the Long Range Plan. sPHENIX R&D is supported by the DOE Office of Science and also by Brookhaven Lab’s Laboratory Directed Research and Development program, BNL Program Development, and in-kind contributions from collaborating universities. By analyzing the highest-energy proton collisions at the Relativistic Heavy Ion Collider (RHIC), a particle collider at the U.S. Department of Energy’s (DOE) Brookhaven National Laboratory, nuclear physicists have gotten a glimpse of how a multitude of gluons that individually carry very little of the protons’ overall momentum contribute to the protons’ spin. The data described in a recently published paper indicate that these glue-like particles—named for their role in binding the quarks that make up each proton—play a substantial role in determining the intrinsic angular momentum, or spin, of these building blocks of matter. “These results confirm our suspicion that a lot of the gluons’ contribution to proton spin comes from the gluons with relatively low momentum,” said Ralf Seidl, a physicist from the RIKEN-BNL Research Center (RBRC) and a member of RHIC’s PHENIX collaboration, which published these results. The results also suggest that gluons’ overall contribution to spin might be even greater than the contribution from quarks. Exploring the sources of proton spin is one of the major scientific missions at RHIC, a DOE Office of Science User Facility and the only machine in the world capable of colliding protons with their spins aligned in a chosen direction. RHIC is the only machine in the world that can collide protons with their spins aligned in a particular direction. Measuring differences in the particles produced when the spins in the two beams are pointing at one another (as shown) vs. when they are pointing in the same direction, colliding “head” to “tail,” can help scientists tease out the contribution made by gluons. Nuclear physicists from around the globe, including many supported by the Japanese RIKEN laboratory, come to RHIC to study these “polarized proton” collisions in an effort to solve the so-called proton spin puzzle. The RBRC was established at Brookhaven in collaboration with RIKEN to support young scientists engaged in this and other relevant research. The proton spin mystery originated when experiments in the 1980s revealed that a proton’s spin—a property that influences these particles’ optical, electrical, and magnetic characteristics—does not come solely from its quarks. To tease out the gluons’ role, RHIC physicists collide two beams of protons with their spins aligned in the same direction, and then with the polarization of one beam flipped so the spins are “antialigned.” The PHENIX detector measures the number of particles called pions that come out of the collision zone perpendicular to the colliding beams under these two conditions. Any difference observed in the production of these pions between the two conditions is an indication of how much the gluons’ spins are aligned with, and therefore contribute to, the spin of the proton. Results reported in 2014 indicated that gluons definitely play a significant role, but the uncertainty about the size of their contribution was fairly large. Both the energy of the collisions and the angles at which RHIC’s detectors were measuring limited the range of gluons those experiments could explore. The data show that these “wimpy” gluons play an outsized role in contributing to proton spin. The reason, the physicists say, is that there are so many of them. “The density of gluons increases very rapidly for very low momentum fractions,” Seidl said. The measurements of low-momentum-fraction gluon polarization, and these particles’ large contribution to overall proton spin, have reduced the uncertainties about the overall size of the gluon contribution to spin somewhat. While the previous results indicated that gluons might contribute about as much as the quarks and antiquarks, the new findings may bring the gluons’ total contribution a bit higher. “Large uncertainties remain and there’s room for improvement in these measurements,” Seidl said. There are also other ways to look for contributions from even lower-momentum-fraction gluons, including exploring particles emerging from collisions at more “forward” angles. “Extending the momentum fraction range even further to lower values is one of the remaining goals of the RHIC spin program,” Seidl said. It’s also one reason nuclear physicists would like to build an electron ion collider (EIC), a machine that would use an electron beam to probe the internal structure of the proton even more directly. Research at RHIC is supported by the DOE Office of Science (NP) and these agencies and organizations. The upper panel of this image, created based on calculations by Brookhaven Lab nuclear theorist Bjoern Schenke, represents initial hot spots created by collisions of one, two, and three-particle ions with heavy nuclei. 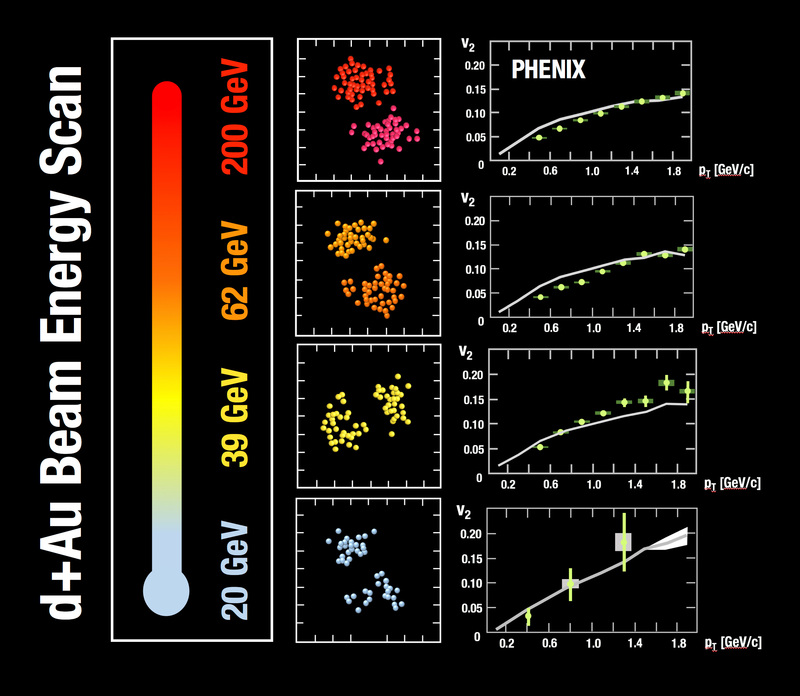 The lower panel shows the geometrical patterns of particle flow that would be expected if the small-particle collisions are creating tiny hot spots of quark-gluon plasma. No image credit. The Relativistic Heavy Ion Collider (RHIC), a particle collider for nuclear physics research at the U.S. Department of Energy’s (DOE) Brookhaven National Laboratory, smashes large nuclei together at close to the speed of light to recreate the primordial soup of fundamental particles that existed in the very early universe. Experiments at RHIC—a DOE Office of Science User Facility that attracts more than 1,000 collaborators from around the world—have shown that this primordial soup, known as quark-gluon plasma (QGP), flows like a nearly friction free “perfect” liquid. New RHIC data just accepted for publication in the journal Physical Review Letters now confirm earlier suspicions that collisions of much smaller particles can also create droplets of this free-flowing primordial soup, albeit on a much smaller scale, when they collide with the large nuclei. These results build on earlier findings from collisions of two-particle ions known as deuterons with gold ions at RHIC, as well as proton-lead and proton-proton collisions at Europe’s Large Hadron Collider (LHC). They also set the stage for the current run colliding protons with gold at RHIC. The discovery of the “perfect” liquid at RHIC, announced definitively in 2005, was largely based on observations of particles flowing in an elliptical pattern from the matter created in RHIC’s most energetic gold-gold collisions. This flow was a clear sign that particles emerging from the collisions were behaving in a correlated, or collective, way that contrasted dramatically with the uniformly expanding gas the scientists had expected. Additional experiments confirmed that this liquid is indeed composed of visible matter’s most fundamental building blocks, quarks and gluons, no longer confined within individual protons and neutrons, and that the flow occurs with minimal resistance—making it a nearly “perfect” liquid QGP. When RHIC physicists checked data from the RHIC run of 2008, when deuterons (a nucleus made of one proton and one neutron) were smashed into gold ions, they saw a similar pattern. “Since the deuteron is two particles, it creates two separate impacts on the nucleus—two hot spots that appear to merge and form an elongated drop of QGP,” Nagle said. Those observations triggered the idea of testing for flow patterns in a range of more tightly controlled experiments, which is only possible at RHIC, where physicists can collide a wide variety of ions to control the shape of the droplets of matter created. With additional deuteron-gold collisions already in hand, the RHIC scientists set out to collide three-particle helium-3 nuclei (each made of two protons and one neutron) with gold—and later, single protons with gold. “The PHENIX detector can pick up particles coming out of collisions very far forward and backward from the collision point. This large angle coverage allows us to measure the flow in these small collision systems,” said Shengli Huang, a PHENIX collaborator from Vanderbilt University who carried out the analysis. “PHENIX also has a trigger detector that picks up and records the most violent collisions—the ones in which the flow pattern is most apparent,” he said. 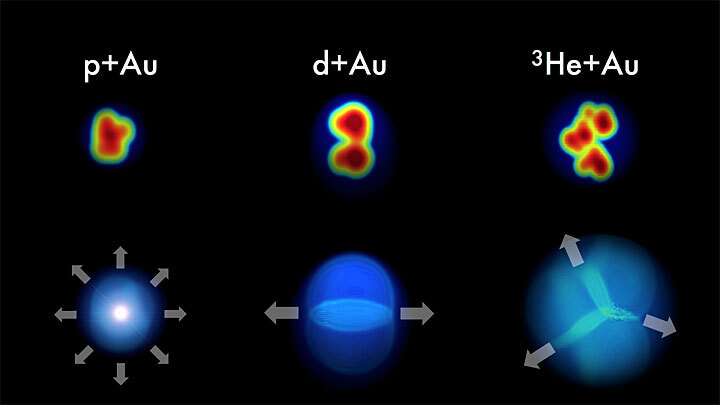 The analysis of those events, as described in the new paper, reveals that the helium-gold collisions exhibit a triangular pattern of flow that the scientists say is consistent with the creation of three tiny droplets of QGP. They also say the data indicate that these small particle collisions could be producing the extreme temperatures required to free quarks and gluons—albeit at a much smaller, more localized scale than in the relatively big domains of QGP created in collisions of two heavy ions. There are other key signatures of QGP formation, such as the stopping of energetic particle jets, which have not been detected in the tiny droplets. And other theoretical explanations suggest the flow patterns resulting from some of the small particle-nucleus collisions could emerge from the interactions of gluons within the colliding particles, rather than from the formation of QGP. If other models also turn out to be compatible with the helium-3-gold data, physicists will want to explore whether these models make predictions that differ from those of the hydrodynamic flow model, and for which types of collisions. “The good news is that RHIC, with its unrivaled versatility, will likely be able to study any system that can discriminate between different models,” Mueller said. Research at RHIC is funded primarily by the DOE Office of Science. Research at RHIC is funded primarily by the DOE Office of Science and also by these agencies and organizations.